product is that it helps keep plastics out of our landfills and oceans. environmental costs,” said Kat Nouri, Founder & CEO of Stasher. 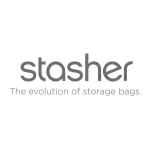 Stasher is a proudly Women Owned Business, making moves for the planet.